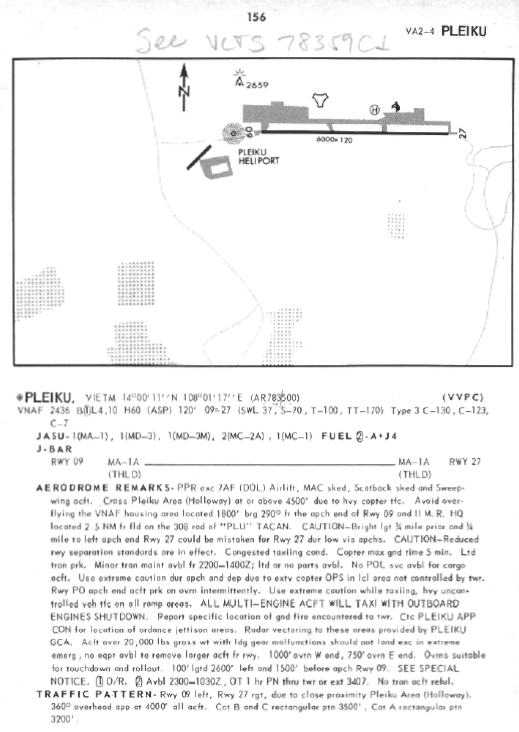 In order to qualify as an aircraft commander I had to learn the Vietnam way of doing things, practice landing big airplanes on little airfields, then take a check ride to prove it. When I arrived in country there was a bit of a lull and not many missions to short fields, so my checkout took longer than I expected. All C-130 pilots had received months of training at Little Rock AFB and Pope AFB, but some did not pass the in-country checkout. Instead of becoming aircraft commanders they spent their tours in operations jobs and flew only for currency requirements. It's 12:30 ayem in Rocket City (Danang). I finally got to fly a leg--from Quinhon to Danang. Did reasonably well if I do say so myself. My instrument crosscheck is still a little slow. Now at Hue. As we came in I noticed somebody (hopefully the good guys) lobbing rockets into a nearby dark hillside. Hue has virtually no support facilities for big airplanes and as is customary at all such bases, we cuff one prop (feather it to the max blade angle) so that if we can't get our engines started normally we could get a buddy start ("airstarting" that engine with the propwash of another airplane positioned directly in front). Got back to Tan Son Nhut about 7 this morning with eyeballs like sandpaper. It took 20 minutes to taxi in because we were taxiing in the opposite direction of most traffic--most people here fly only in the daytime. 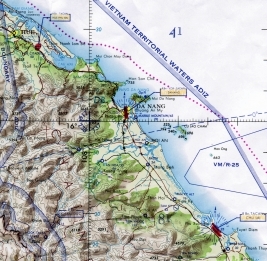 We had an expected aerial port delay at Cam Ranh Bay. So the nav and I crawled up on top of the airplane and sacked out. And it's disorienting to awake at dawn lying atop a C-130 and wonder where you are! After stops at Cam Ranh, Quinhon, and Phu Cat we headed for Pleiku. At Phu Cat it had been completely clear. 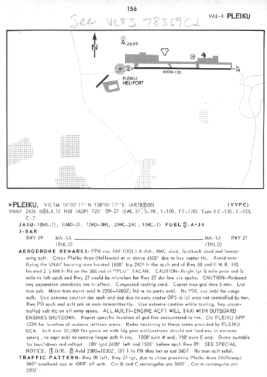 Just over the mountain at Pleiku they were calling the weather 200' overcast with 1/4 mile visibility. 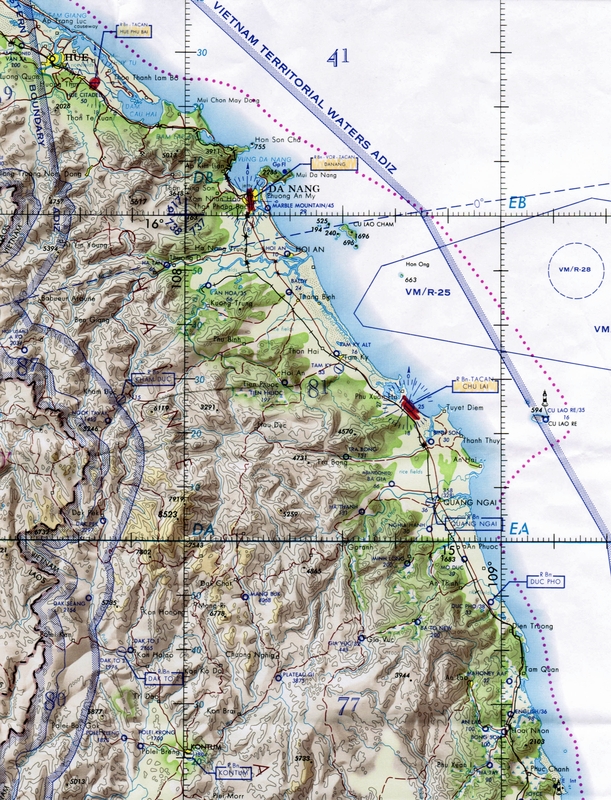 We shot a GCA approach down to minimums (300') there, then went missed approach without ever glimpsing the runway! Returning from Pleiku to Cam Ranh. I flew the leg from Phu Cat to Pleiku today. 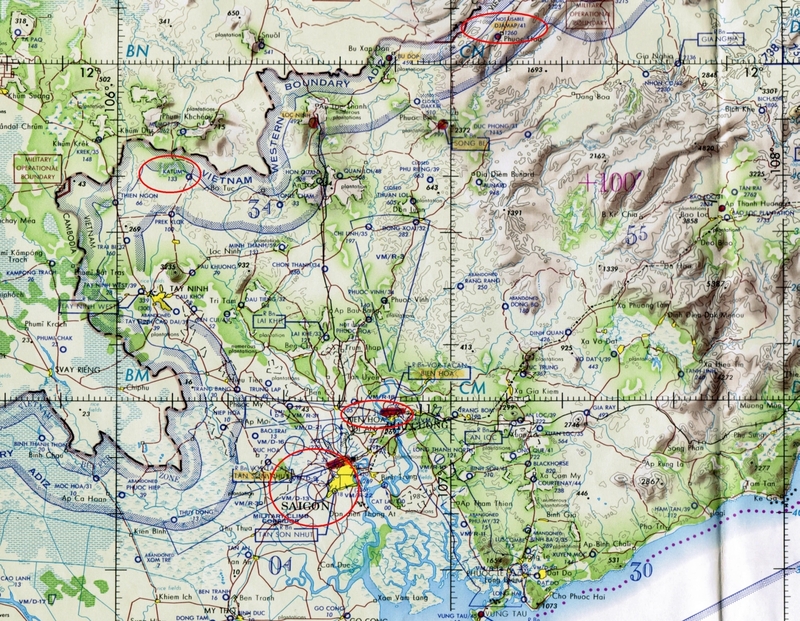 Like yesterday it was low overcast at Pleiku, but this time we broke out at 400' and landed. Not the world's best approach & landing, but it was the first instrument approach I'd made since April! Homeward (which is to say Tan Son Nhut)-bound and all of a sudden we're skimming along the water at 200' watching an airstrike on the beach. 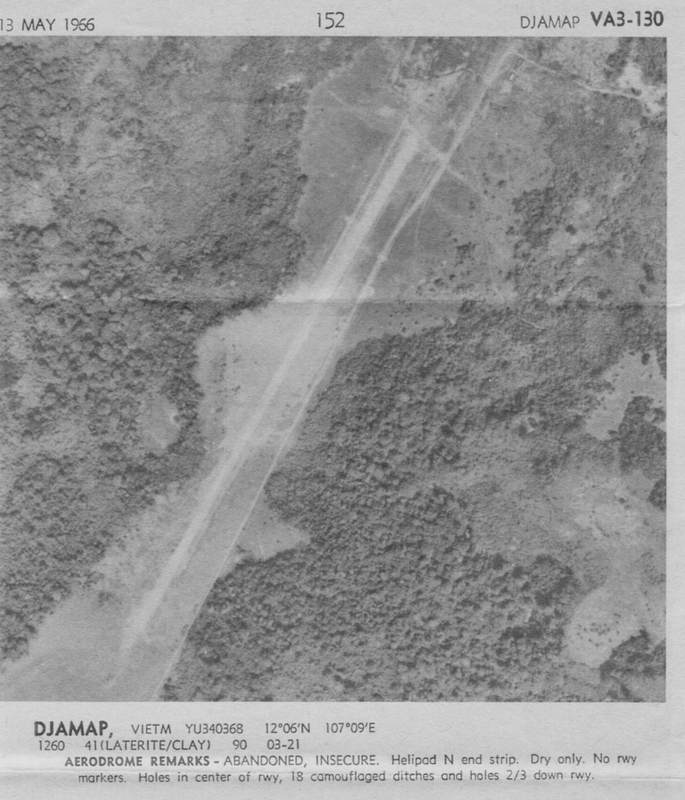 Djamap was about 10 miles from the Cambodian border. It was also known as Bu Gia Map and Firebase Snuffy. It had been abandoned four years earlier, then reactivated for the 1970 Cambodian incursion. The place is now a nature preserve. We just departed Djamap for Tan Son Nhut. We took in a combat control team and an adverse terrain forklift and brought out an airplane-full of pallets. Djamap was just our first stop of the day--the fun has just begun. 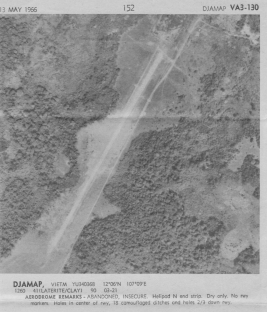 Djamap is a 3600' dirt strip about 10 miles from Cambodia. It's on route 309 on your Esso roadmap. It's the one that's marked "NOT USABLE". The flick The Green Berets was based on a battle that occurred at Djamap when a lot of guys were killed. 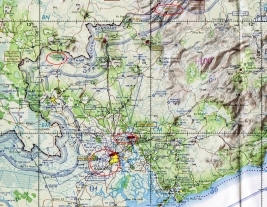 The place was abandoned, then re-occupied when the Cambodian operation began. We only have about 2 frags a day going to short fields now, but you have to get a certain amount of short field work to complete a SEA checkout. Sigh. I had a good flight today. We had a one ayem show and tho I only got 4 hours' sleep last night I felt pretty good. 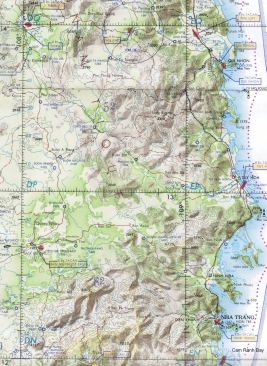 I flew the legs from TSN to Phu Cat, Chu Lai to Hue/Phu Bai to Danang, then Phu Cat to TSN. We had a good bit of weather and I did a pretty good job if I do say so. Woodie Woodworth (and the whole crew) is a pleasure to fly with. I feel quite lucky to have him as an IP. At Hue the weather was 600' overcast with rain and we were in the soup. The TACAN was off the air and radar said they couldn't paint us because of the rain (what good is a radar if it can only be used when the weather's good?)! 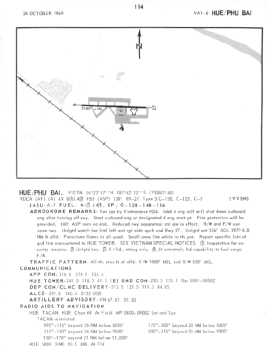 The one remaining instrument approach is an ADF/NDB, a very non-precision approach aid. We broke out of the soup at about 500' and a mile from the field. I made a zig-zag to get lined up with the runway and got the beast down safely albeit I landed rather long. It was minimum weather for an ADF and I think I did a pretty good job. The departure was hairy too. We got a rather complicated clearance via the 340 degree track to the RS radiobeacon (ADF). The beacon was some off-the-wall unit not even listed in the aviation publications. Then as we got airborn and were about to go into the soup again they changed our clearance via the 340 degree track to the OF radiobeacon (which we'd never heard of either) and for a minute it was all assholes and elbows retuning ADF's and finding out where this other station was as we mucked around in the soup. 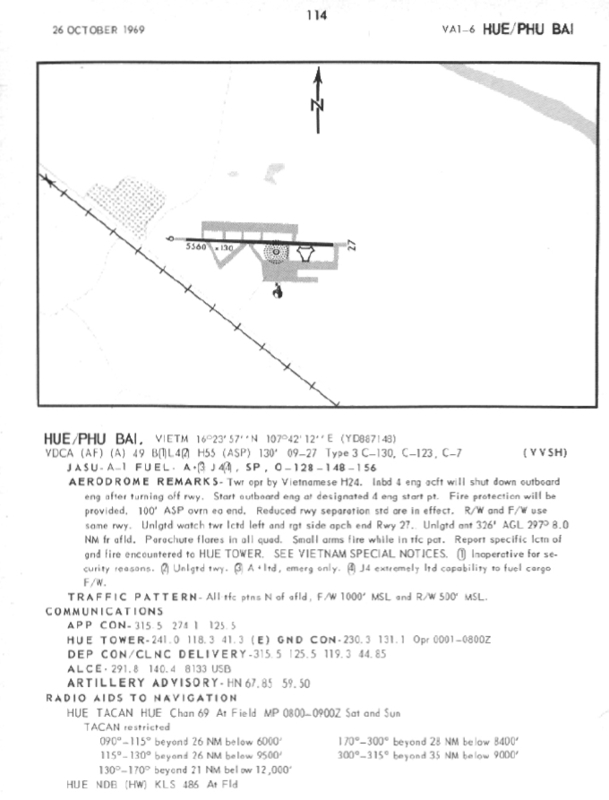 I wrote an Operational Hazard Report (OHR) on Hue Departure Control for changing a clearance at a very critical time. They had ample opportunity to give us the change before we got airborn and into the weather. The official response to my OHR was that the pilot should always be prepared for changes. Thanks. Danang was weathered in too and I got a GCA approach in there. Much better organized. All in all it was a pretty satisfying flight. Some IP's won't allow their students to make decisions, but that's half the job of being an AC. Wooodie, I'm glad to say, let me do things however I wanted short of crashing the airplane. And I think I made pretty good decisions.